Home » Sports » Virender Sehwag scores 175 vs Bangladesh! Gets his revenge! 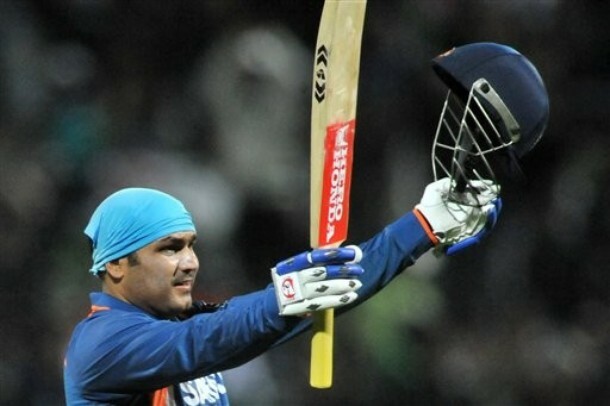 Indian Opening Batsman Virender Sehwag has kick started the ICC Cricket world cup 2011 with a bang by scoring 175 runs against Bangladesh. India and Bangladesh begin the world cup 2011 opening match in Mirpur, Bangladesh this saturday. Bangladesh won the toss and elected to bowl first. Indian opening pair Sachin Tendulkar and Virender Sehwag played a sensible innings before Sachin was run out for 28 . Later Gautam Gambhir and Sehwag played well by scoring 1’s and 2’s with the odd boundary. After Gambhir was bowled out for 38 runs, the young Kohli joined the thunderous Sehwag. Both Batsman completed the century. Sehwag got out at the 48th over with a score of 175. Kohli, however, remained unbeaten with 100*. India scored 370-4 for 50 overs. The match is currently live with Bangladesh to begin their batting. Did i mention Sehwag got his revenge? Yes, Sehwag said on friday, i will take revenge against Bangladesh for the embarrassment which we (Indian team) suffered in the 2007 world cup. I must say Sehwag is a man of his words.